Everyone knows that flea markets are a great place to find vintage clothing, antiques, and one of a kind items, but navigating through the stands, especially in a foreign city, can feel overwhelming and daunting to even the most experienced thrifter. To make what can be a traumatic experience a little more manageable, The Untitled Magazine has broken down the biggest flea markets in London, New York, and Paris so you can avoid the chaos and focus on exploring the remarkable goods they have to offer. For those who are handy with a sewing machine, Shepherd’s Bush Market and Goldhawk Road fabric markets are the perfect place to pick up unique fabrics in every color and style that can be made into anything from a chic new cocktail dress to quirky, original home goods. When looking for antiques in London, stop by the Sunbury Antique market and the bi-monthly Kempton Park market. Both have a huge selection of antiques at every price point, but if you’re looking for something a little more upscale, Alfies Antique market on Church Road is the place to go. The market not only has exquisite furniture, but, also, a rooftop café where you can relax and eat a snack after an exhausting day of shopping. If local, culinary treats are what you’re after, head to the Broadway Market where you can pick up a famous hog roast sandwich from Rainha Santa, a wheat-free brownie from the Cinnamon Tree Bakery, or delicious coffee from La Bouche café. Venn Street Farmer’s Market in Clapham and Chapel Market in Angel are also great places to pick up organic fruits and vegetables. If you’re looking for original art for your home, a stop at Bayswater Road Market next to Kensington Gardens is a must. If you want to have a fun day out, and love shopping, antiques, music and retro hippy vibes, than the market on Saturdays on Portobello Road is the place to be. They also have a smaller one on Fridays if crowds aren’t your thing. The Camden Market is another hugely popular London flea market, which actually consists of several different markets covering the Northern end of Camden Town. At one time, Camden was the undisputed centre of London’s alternative scene, and although things have changed for the area, the market can still be a source of great vintage, retro, and punk pieces. Although much of the market caters largely to tourists, offering up an array of knick-knacks, trinkets, and food stands, past the witty slogan t-shirts can be found beautiful vintage pieces, antiques, second-hand books, and retro home decor and accessories. And if you’re shopping and happen to find yourself with an impulse to get a piercing, Camden Market can help you out with that as well; Camden Market’s Cold Steel has been piercing visitors for over seventeen years! Finally, while you’re in London, make sure to check out the Portobello Market, which winds down Portobello Road in fashionable West London. You might recognize this market as Hugh Grant’s neighborhood in Notting Hill. Since the film came out, prices may have gone up a bit, but the market retains its eclectic, whimsical vibe despite the weekend crowds of tourists. If you’re after high-end quality clothing at half the price, head under the Westway where new, young designers can be found selling their designs for next to nothing. Closer to Notting Hill Gate you can find retail spaces filled with some of London’s best antique dealers, but be prepared to get out your check book. 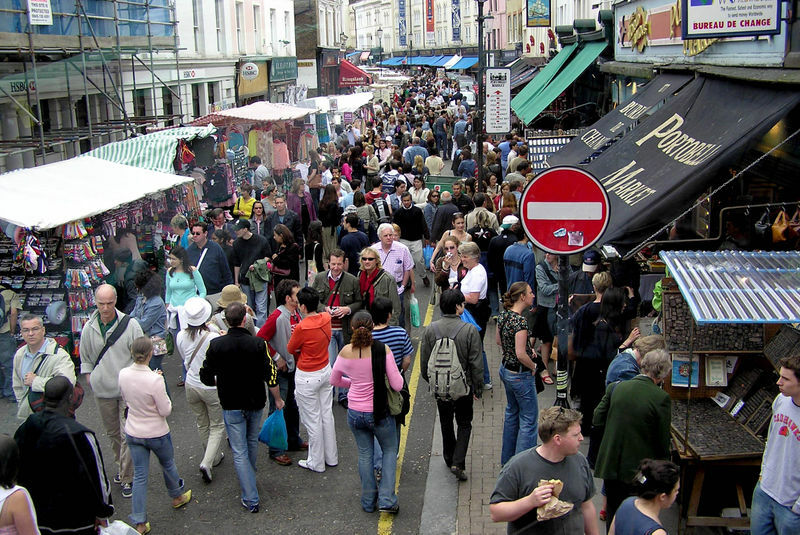 The Portobello Market offers everything from antiques to clothes and food depending on which day of the week you visit, except on Sunday when it closes, but head there on a weekday afternoon for some prime tourist-free shopping! For real flea market finds its necessary to take a short trip into Brooklyn. The Brooklyn Flea Market is broken into three markets Fort Greene, Williamsburg, and Smorgasberg. Founded in April 2008, the Brooklyn Flea has quickly turned into the place to go for vintage, collectables, and antiques, not to mention their immaculately curated selection of jewelry, art, and crafts by local artisans and designers. The New York Times has even called the Brooklyn Flea “One of the great urban experiences in New York.” The Brooklyn Flea’s Fort Greene flagship location is a 40,000 square-foot schoolyard that brings together 150 vendors every Saturday from April through November. The Fort Green location hosts a mix of vendors specializing in antiques, vintage fashions, and tasty local fare. It’s also a great spot for watching the parade of hipsters and fashionistas who make the trip out to Brooklyn every weekend specifically for this flea market. The Brooklyn Flea’s Williamsburg location on the waterfront between North Sixth and Seventh Street offers a similar mix of vendors to the Fort Greene market in a more Manhattan-friendly location. Smorgasberg, also at the Williamsburg location, is the newest addition to the Brooklyn Flea family, providing a giant, all-food market that features over 75 local vendors of packaged, fresh foods, and food related wares. Also, make sure to look out for special pop-up Brooklyn Flea locations during the winter selling perfect gifts for the holidays! Luckily, for those who can’t bear to leave Manhattan but have the urge to bargain hunt, the Hell’s Kitchen Flea Market is conveniently located in the Chelsea and Hell’s Kitchen neighborhoods. The flea is divided into three markets, The Antiques Grage, the West Twenty-fifth Street Market, and the Hell’s Kitchen Flea Market. The Antiques Garage is located on 112 West Twenty-fifth Street between Sixth and Seventh Avenue and is open every Saturday and Sunday all year long. The Garage offers wares from over one hundred vendors on two floors selling all sorts of vintage items, antiques, paintings, jewelry, and rugs. The West Twenty-fifth Street Market is located on the titular street between Broadway and Sixth Avenue and is also open every weekend all year. The space has over 125 stands offering antiques and collectables alongside mid-century modern items and newer vintage pieces. The Hell’s Kitchen Flea Market, however, of the three, is the market where all the real gems are hidden, but be ready to really look and fight off the crowds! The market was named one of the Top Ten Shopping Streets in the World by National Geographic, gathering together a wide assortment of vendors and high-end collectors to sell antiques, vintage clothing, mid-century and modern furniture and home decor, and everything else under the sun. According to the flea market’s website it draws together, “fashion éclat, artists, celebrities, tourists, and residents,” all to haggle on great vintage items and unique antiques. The market is located West Thirty-ninth Street between Ninth and Tenth Avenue open year round every weekend, and includes vendors from The Annex, part of the flea formerly located in Chelsea. One things for sure, it’s hard to leave the Hell’s Kitchen Flea Market without finding at least one trinket that you’ll absolutely love! Paris is known for its street markets, every day of the week small trinkets, vintage goods, and stands full of local foods can be found just around every corner. But for specialty antique items, hard to find vintage pieces, and collectables, Les Puces are a must. Les Puces de Saint-Ouen at Porte de Clignancourt are by far the most famous flea markets in Paris, but also the most daunting! The labyrinth like streets of Paris are already difficult to navigate without tents and vendors crowding you from all sides. Les Puces are over two centuries old, originating from when rag-and-bone men used to dig through the garbages of Paris at night scavenging for goods to sell. A lot has changed at Les Puces since then, with vendors selling everything from touristy plastic knick-knacks, to high-end vintage designer clothes. The Rue de Roisiers is the main street of Les Puces that contains tons of stores overflowing with wares. The Marché Vernaison and the Marché Antica are two of the first stores you’ll come across on the Rue de Roisiers and their size can be daunting, but inside is a flea marketer’s dream, containing antique housewares, paintings, mirrors, and textiles with amazing Art Deco pieces. The Marché Brion right next door, although pricier than its neighbors, has a wide selection of furniture, with lots of gilded Louis XVI-style antiques. The Marché Dauphine is the newest, and quite possibly largest, addition to Les Puces, offering visitors a taste of everything the surrounding markets have to offer. It also has a crêpe stand out front and a nice café and restaurant located in the back for the weary bargain shopper. Marché Paul Bert is a must-see with an amazing selection of vintage and kitsch items from the 50s and 60s mixed in with beautiful, if pricey, antiques from the Marché Serpette next door. With this information you’ll be ready to navigate some of the trickiest flea markets around the world. But don’t forget, unlike a regular store, no price here is fixed, so get out there and haggle!